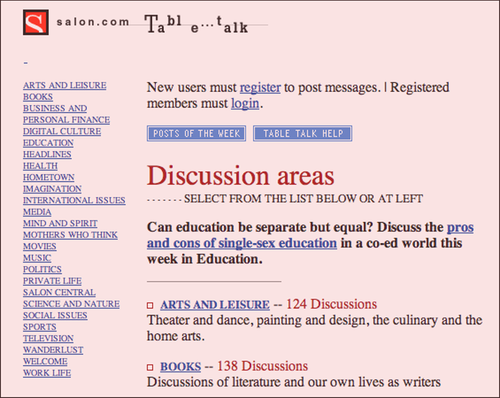 Salon.com Wednesday announced plans to close Table Talk, the online discussion space and community that has operated continuously since Salon’s launch on Nov. 20, 1995. I was involved in Table Talk’s creation and management for its first several years, and when I read the news, I flashed back to my first day at Salon. As the tech-savviest of a not-tech-savvy-at-all gang of newspaper refugees trying to build a web magazine, I got pulled over by our then-publisher. He’d been tearing his hair out trying to get a group of unruly Cornell students to write the software that would power Table Talk, which was going to be Salon’s big bid for being not just an online magazine but an “interactive” website worthy of the Salon name. Things weren’t going well. “I want you to project manage this,” the publisher said. I thought, “What do I know from ‘project manage’? I’m a critic!” Then I dove in, because, in a startup with six employees, that was what you did. For me it was the start of a deepening engagement with and affection for the excitement, complexity and pitfalls of building software-powered websites. (Salon itself was lovingly hand-coded then and for several years after.) We got Table Talk launched, sort of, though within weeks we had to ditch the version those Cornell kids had built and start fresh. Said kids took their software and built TheGlobe.com with it, which went on to an impossibly successful IPO at the height of the dotcom bubble before a spectacular flameout. The original idea was that every Salon article would have a link at the end to a Table Talk thread. The articles would serve, in part, as discussion-starters and then our community would kick the ideas around. It wasn’t a dumb plan — story comments are now a Web standard. But the way we built it, modeled on the experiences some of us had had as members of The WELL, Table Talk was a separate space with threaded discussions that anyone could add. The conversations weren’t tied to the stories very well, and we quickly learned that the community members — who took to the project avidly — preferred to talk about what they wanted to talk about. Salon’s editors and writers rarely hung out in TT, and it didn’t take long before the TT members developed a dysfunctional relationship with Salon’s staff — simultaneously craving our attention and resenting our presence. So TT went its somewhat separate way from Salon-the-magazine, which soon started running a simple, hand-coded letters to the editor page to highlight actual responses to our stories. Mary Elizabeth Williams, its original and longtime host, managed the discussion space with great love and devotion for years. We all learned a lot about dealing with anonymity and trolls, personal authenticity and online performance art, technical woes and social dynamics. What we never managed to do was find a way to knit the energy and talent of Table Talk’s remarkable community with the skills and money being invested into Salon.com itself. Instead, Salon tried over and over to find different models for tying community together with journalism. In 1999 it acquired The WELL. In 2002 it launched a blog program. In 2005 it transformed Letters to the Editor into a more web-standard comments feature. In 2008 it launched Open Salon as a modern, social blogging platform. As a result, Table Talk became, more and more, a separate entity. When we started Salon Premium in 2001 as a paid service that let users see an ad-free site and some premium content, we rolled Table Talk into it: its pages were readable by anyone, but you needed to pay to post. That insured its survival but also assured its marginality. Over the years Salon’s management (which I was a part of until 2007) considered, over and over, whether to shut it down. It generated large numbers of page views from a relatively small number of users and advertisers were not excited by that. Its WebCrossing software was increasingly out of step with the direction the Web was moving in. Yet TT’s community remained close-knit and vibrant. In the wake of this week’s announcement, its members, unsurprisingly, are already trying to figure out ways to continue their conversations after the site’s announced June 10 shutdown date. [Interactivity] is just a clumsy word for communication. That communication — each reader’s ability to be a writer as well — was not some bell or whistle. It was the whole point of the Web, the defining trait of the new medium — like motion in movies, or sound in radio, or narrow columns of text in newspapers. Editors and publishers keep crossing their fingers and hoping to find some new platform that reverses this principle and puts them back in the comfortable realm of piping content out to consumers. They think this stuff will finally settle down. But change keeps accelerating instead. Today we are feeding one another stories, passing links around, telling friends what we’re fascinated by or excited about or steamed over. My Flipboard is more useful and interesting to me than the front page of the New York Times (sorry, Bill Keller). The conversation isn’t an after-thought. It’s interesting in itself, and it’s how we inform one another. So Table Talk is dead: RIP. But Table Talk is everywhere, too — on Facebook and Twitter, all over the blogosphere, and in a billion comment threads. Table talk is what we do online. It’s not what comes after a publication’s stories. It’s what comes before. Independent commercial Web publishing: still exhausting? You’ve probably heard by now that Mike Arrington has sold TechCrunch to AOL. Congratulations to him and to AOL, which has bought itself some talented people, some good traffic and no doubt some headaches down the road. The truth is I was tired. But I wasn’t tired of writing, or speaking at events. I was tired of our endless tech problems, our inability to find enough talented engineers who wanted to work, ultimately, on blog and CrunchBase software. And when we did find those engineers, as we so often did, how to keep them happy. Unlike most startups in Silicon Valley, the center of attention at TechCrunch is squarely on the writers. It’s certainly not an engineering driven company. This description jumped out at me because it was so familiar — and also because it surprised me. I guess I hoped and trusted that the “endless tech problems” that were at the heart of my experience at Web 1.0-era Salon.com (they led me to write a book) were a thing of the past. What Arrington is saying is that the stuff that was hard 10-15 years ago is still hard today. I guess I should have expected that. At Salon, we had some highly gifted people working for us at different times on the technology side, we built a robust CMS that’s still operating (and that spawned its own open source version), we built our very own pay wall in about a month in 2001, and we pioneered all sorts of useful things in our day. But it was exhausting for an organization that was driven by its editors and writers to also have to figure out how Web publishing worked, technologically and economically; to build systems that would scale well and bend to our needs; and to work out how sales and marketing could make sense in the new medium. By the second half of the decade I spent at Salon I know I spent far more of my hours dealing with those issues than writing or editing copy. I remember thinking enviously of the position our sometime rivals at Slate occupied; they’d always had the benefit of being tied to a larger enterprise — first Microsoft, then the Washington Post. No doubt that had its own frustrations. But it meant they could concentrate on the fun stuff without having to invent and manage the entire business and technology operation simultaneously. This is why I always stop and think when I hear friends and colleagues repeat the truism that “the journalism is the hardest part.” We said that a lot at Salon, and I still hear it today, but I no longer think it’s true. Good journalism is always work, sure — but it’s known work. We know what it takes to do it right. The challenges of independent publishing online, on the other hand, are the real “hard part” of this industry. I bet any entrepreneurial publisher you ask will agree — go talk to Rafat Ali or Om Malik or Pete Rojas or anyone else who has tried to build their own Web-based publishing enterprise over the past decade. The thing is, if you’re the sort of entrepreneur that I’m guessing Arrington is, the hard stuff may be exhausting, but it’s also what gets you up in the morning. That’s one reason startup founders so often spin their wheels after they’re acquired; designing and building your own little speedboat is just a lot more absorbing than managing how to integrate your personal craft with a battleship-scale corporation. It’ll be interesting to see how this plays out for the TechCrunch crew. Ten years ago today, Salon.com, the website I helped found in 1995 along with a group of colleagues from the San Francisco Examiner under the leadership of David Talbot, went public. We raised $25 million in an IPO that, from the vantage of a decade later, looks mirage-like in its improbability. Today, of course, a Web company with little to offer besides some (extremely good) original content could never raise $25 million from investors, right? Actually, it seems to happen again and again. Strangely, this is a road that others continue to charge down with, apparently, only a vague sense of the history or the pitfalls. One of the things we were proudest of about Salon’s IPO was the open, Dutch-auction style approach taken by our lead investment bank, W.R. Hambrecht & Co. (Jim Surowiecki wrote about the approach in Slate.) Hambrecht’s idea was to make the entire IPO process more fair and transparent by allowing investors to participate in setting the opening price in public through a novel auction approach. Our choice of this model was later vindicated when another little Silicon Valley company named Google adopted it for its own IPO in 2004. Salon survived, against the predictions of a chorus of schadenfreude-driven critics, and found its place as the Web resumed its growth from the post-bust rubble. I left the company two years ago to work on Say Everything, but I’m proud of the project I conceived and developed in my final year there, Open Salon. Under Kerry Lauerman’s leadership it has emerged as a true community of writers and readers — in some ways, fulfilling the original concept of Salon that David Talbot articulated in 1995 even more fully than the old-school Salon site. 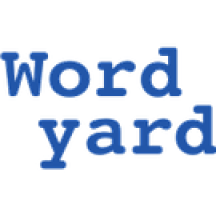 Every post I’m writing here at Wordyard these days is mirrored over at my Open Salon blog (as well as on Facebook and other services). Write once, publish everywhere, talk with people anywhere they want to engage with you: not a concept that would have made it into a 1999 IPO prospectus, but one that makes a lot of simple Web sense today. Is there a Bones McCoy anywhere in the company who can provide a humanist counterweight to all that calculation? Maybe — but you’re not likely to learn who it is from Stross’ research. “Planet Google” is solid and informative, and Stross, refreshingly, avoids the frothier sort of Google hype sometimes heard from the tech-punditry choir. But the book is hardly the insider’s-eye view of Google that it has been painted to be. If Google is going to falter over the coming decade, it is likely to be the result of avidly pursuing its “organize the world’s information” goal even as the evidence mounts that its Spock-like principles and engineering-first culture may not get the company to its destination. Stross’ account provides several case studies — including accounts of the oddly neglected Orkut social networking site and the ill-fated Google Answers service — in which innovative Google ventures foundered because of the company’s clumsiness at managing human interaction. Not one but two big developments (coincidentally simultaneous) in projects that are intertwined with my life! The first, noted below, was Chandler 1.0. The second is the unveiling — for what is being labeled a public beta — of something called Open Salon. While the news is not live on the Salon site yet, it’s already on Techmeme, so I’m going to go ahead and note it. Open Salon is the present incarnation of a project I proposed a long time ago at Salon as we tried to figure out a future for the old Salon Blogs program, which had been built on Radio Userland, a program that had fallen by the wayside. When Dreaming in Code was done I returned to Salon and started to work on it. A year and a half later, we had some neat prototypes, but we were still awfully far from launching, I got excited about a new book idea, and it was time for me to move on. The Open Salon that opens its doors today — it’s been in private beta for a while — is an outgrowth of the work I did back then, but of course over the past year the project has evolved much further. I’ve been concentrating too assiduously on my book deadline to do more than cheer the present effort from afar, and I can take little credit for much of anything about Open Salon in its present form. It’s the work of Kerry Lauerman and his team — and, now that the participants are using it, it’s in the hands of Salon’s readers the people formerly known as Salon’s readers, to make of it something new and exciting. The one thing I’ll claim is to say, proudly, that from day one at Salon I was the editor pushing the publication hardest toward opening out to the Web and experimenting with ways of using it to bridge the ancient divide between writer and reader. I’m delighted to see Salon taking this next step. Congratulations to everyone there who helped make it happen. There’s a post by Matthew Ingram up already. Also one at CNet (“Salon launches blogger ‘tipping’ system”) that, I think, may put far too much emphasis on one small feature of the project — the “tip jar.” I have no inside information but it seems inevitable to me that Salon will want to experiment with the whole idea of reward mechanisms, and I would be really surprised if the “tip jar” was the only effort made in that direction. UPDATE: Joan Walsh’s official announcement about Open Salon is now up. Customer service is the what? Tomorrow I plan to attend the “Customer Service is the New Marketing” conference that the folks from Get Satisfaction are holding at the Presidio. This doesn’t sound like my normal field but it’s actually a topic close to my heart. At Salon I was a big believer in customer support as an ambassadorial function for the company. At the site’s launch in 1995, I manned the e-mail barricades, responding personally to most of what came in. (In those days, getting a few hundred messages for a Web site launch was a sign of runaway success.) When we launched Salon Premium in 2001, I handled the customer support myself for the first two weeks. If you’re an executive in charge of a Web launch, there is no better way to get a handle on what’s working and what’s not. And while it’s good to keep developers in the feedback loop as well, you can’t expect them to handle all the response — they’re likely to be busy fixing any of the problems users are uncovering. Way back in the Pleistocene Andrew Leonard wrote a piece for Salon that I edited, describing a future in which more and more tech support problems could and would be solved by a quick Web search. Today, I don’t even bother attempting to communicate directly with most companies; who wants to navigate phone-tree hell? If I have a problem, I poke around on the Web until I find an answer. If I don’t, I’ll post a question on the likeliest Web forum. So there’s interesting stuff happening in this area. I’ll see what’s worth reporting on tomorrow. I knew Bob from his start at Salon as a photo intern in 1998, but worked closest with him during the dark years after the dotcom bubble burst, when Salon’s prospects were dim and budgets were slim. Some of Salon’s editors fought their own guerrilla battles against our financial woes by spending money they didn’t really have, and it was my job as managing editor to try to reel them back toward reality. I never had to do that with Bob: at the end of each month he’d calmly deposit the art department’s report on my desk, and it was so reliably in order and under budget that, I confess, I took to reviewing it less and less closely over the years. It could simply be counted on, as could he. Stereotypes paint the artist as undisciplined and indulgent. Bob wasn’t a stereotype; he was the real thing, and so he approached his work with care and consideration, balancing his own abundant inspiration with the needs of the people around him, working fast on ridiculously tight deadlines to create consistently delightful images. He must have produced, literally, thousands of Salon cover images over the years, each one a witty or moving or beautiful little time capsule. I will miss them, as I will miss him. From the earliest days of the Web to the present, there’s been a fundamental split between people who get the value of “human-readable URLs” and people who don’t. A human-readable URL is a Web address that tells you a lot of useful information about the page it represents. For instance, Salon URLs always tell you the date an article was posted, the section of the site the article appeared in, and a few words describing the subject matter of the article. By comparison, the typical URL at, say, CNET, looks like this: http://reviews.cnet.com/4520-10895_7-6782817-1.html. It is, essentially, human-unreadable. The cause of human-readable URLs got a great shot in the arm when sites began trying to optimize themselves for Google, because Google gives a little extra weight to text hints in URLs. So a lot of sites (like the New York Times) that had a history of human-unfriendly page addresses began to do better. That’s all fine. But the tinyurl giveth and the tinyurl taketh away. When you encode a Web address as a tinyurl you’re hiding its target. Normally, when I read an article on the Web that has a link, I’ll hover my cursor over the link to see where it points. Even on a site with human-unfriendly URLs like CNETs, at least I can see that the link points to CNET. With a tinyurl, I know nothing about the link except what the author chose to say about it. I can’t tell if it’s a reference to an article I’ve already read. If I want to find out, I have no choice but to click. My sense is that tinyurls have grown in popularity with the rise of Twitter (where the strict character limit of messages means you don’t want to fill up a whole message with an URL), as well as the growing use of mobile devices for Web-posting activities. These are perfectly understandable reasons. But still, each time I see a tinyurl I think, there goes another tiny piece of the Web’s transparency. A J-school prof at Cal told me that most reporters have absolutely no idea which of their stories people read or don’t read. They’re flying blind. I bet TV news people are too. But wait, it’s even worse than it appears. Not only do most reporters have no idea which stories are read, many if not most don’t want to know. The traditional view in journalism is that such knowledge is corrupting. If you know what’s popular and what isn’t, you will be driven by such knowledge to degrade your product. So the proverbial “Chinese wall” that’s supposed to segregate editorial decision-making from business influence has generally kept readership data out of the newsroom. At a crude level, journalists fear that, the more granular the information about readership and popularity, the faster the suits will crank up celebrity gossip and defund serious coverage. The falllacy here is that, sorry, the suits already know everything they need to know about the relative popularity of different kinds of content — it’s just the editorial people who are (often) in the dark. And then there is a more sophisticated level: the idea that writers and editors themselves, unpressured by crude strongarming by the business side but simply motivated by their own human need for attention, will find their judgment subtly but inexorably shaped by detailed usage stats. The second concern is, I think, at least partly real, but I don’t lose sleep over it. From day one at Salon, when we were a half-dozen people in sublet space who could barely access our servers, we circulated traffic data to our editors; it simply blew our minds that we could. Over the years we took some heat for the practice, but I still think it makes sense. Ignorance is never a very good state for a journalist. Why choose blindness? Knowing where readers click doesn’t have to dictate your decisions — unless your decisions are poorly reasoned to begin with. In the soup out of which good coverage bubbles, traffic data should be one ingredient of many. The real defense against what used to be called “page-view pandering” is strong, smart editors and writers with their own moral compasses. If you have them, then they deserve access to as much information as exists. If you don’t have them, then you’ve got bigger problems, and restricting access to your traffic stats won’t save you. Alberto Gonzales has bigger problems these days, but his Justice Department just lost the latest round in a longstanding Internet censorship conflict. The Child Online Protection Act went on trial again in recent months, and today, again, a federal court has struck down the law — which would require commercial online publishers like Salon to make sure that their readers are over 18 or face criminal prosecution for publishing material that might be “harmful to minors.” Publishers are supposed to be able to protect themselves from prosecution by requiring site visitors to register with their credit cards, thus ostensibly demonstrating their adult status. The law is supposedly only aimed at commercial pornographers, but the law is absurdly vague. Somehow, publishers are supposed to trust the Justice Department to make the right call and understand who is a “bad” publisher and who isn’t. Placing such trust was problematic when the law was passed, under the Clinton administration; in the era of Bush justice, doing so would be utterly foolish. and (3) COPA is impermissibly vague and overbroad. I am proud that Salon has been a plaintiff in this suit since 1998, when the ACLU first launched it. (Here’s my account of the 1994 oral arguments before the Supreme Court in an earlier phase of the COPA fight.) I have no idea whether, defeated at every turn, the Justice Department will drag this proceeding into another decade by appealing it. In the meantime, we can take another deep breath and be glad for the victory. Here’s the AP story. And here’s a post by Salon editor Joan Walsh, who testified in this most recent round of the case. And here’s the ACLU’s page. And here’s CNET’s story.